What criteria or standard should I use for evaluating Lean & Six Sigma Belt training and certification? Are there best practices for sustaining gains? What is the value of Lean & Six Sigma to me or my organization? How can organizations be successful with Lean & Six Sigma? What are the pitfalls for Lean & Six Sigma? Does Lean & Six Sigma stifle new product/service development? How can Lean and/or Six Sigma be integrated with other methods? 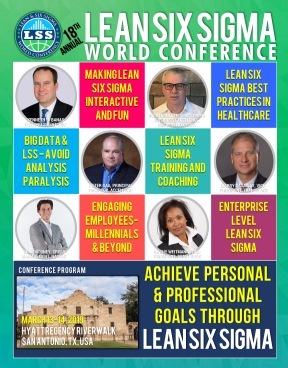 This is your chance to participate in the Lean & Six Sigma World Forum. Join us for this fun activity! During this Networking Luncheon, you may select to be seated depending on your area of interest or expertise. Group sign-up will be made on-site. Please note that group seating is limited and will be assigned on a first-come, first-served basis. Following is a partial list of Networking Groups.